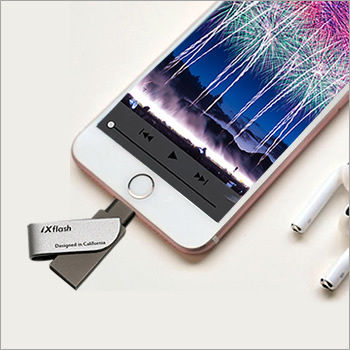 Developed as the ideal pairing for your iPhone or iPad, the iXflash offers 1 touch photo and video back-up for iPhones, iPads, and iPods*. This allows you to quickly and easily free up space on your iPhone or iPad, as well as transfer your content to another device or computer and share with friends and family. Plus the iXflash allows you to take pictures and videos without using any of your iPhone or iPad’s internal memory, freeing you to capture even more memories that you can cherish for life. 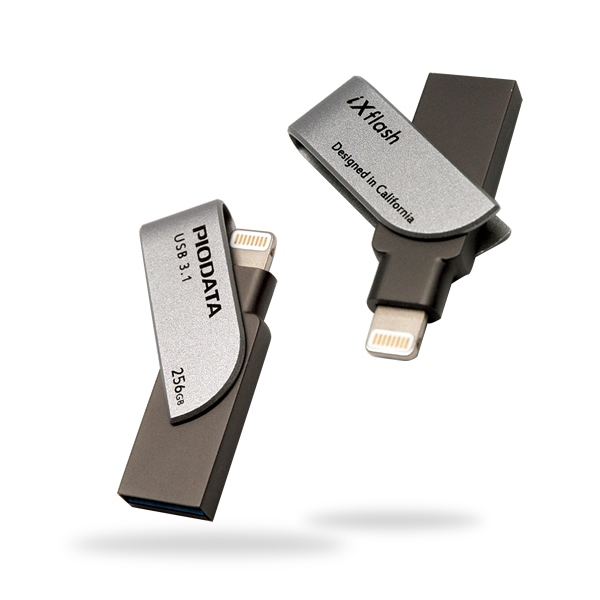 In addition, the iXflash has dual Lightning and USB3.0 connection allowing it to work as a portable media library, storing a whole collection of music, movies, videos, and even data files like pdf, Word, Excel, and more, which can be opened or played directly through an iPhone, iPad, or any computer with a USB connection. Take Pictures and Videos without using your device’s memory You are able to record live video and pictures that are stored directly on the iXflash without using your iPhone or iPad’s internal memory. 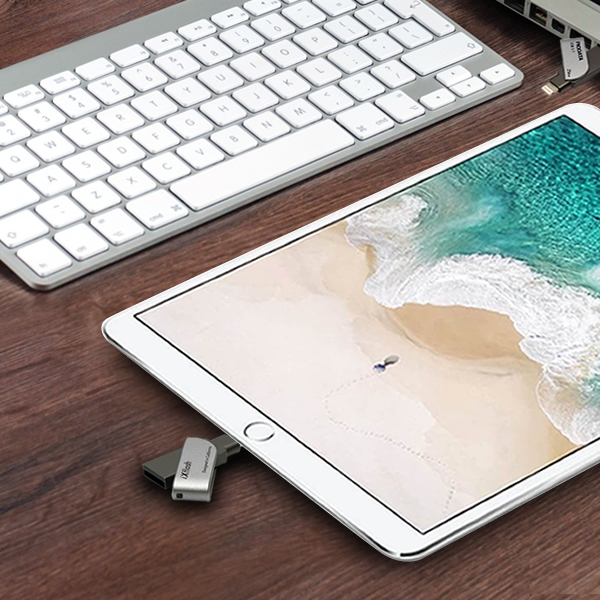 If offers you greater storage that you can access through your iPhone, iPad, or any device that plays back video and images using a USB connection. | FREE UP SPACE FAST! 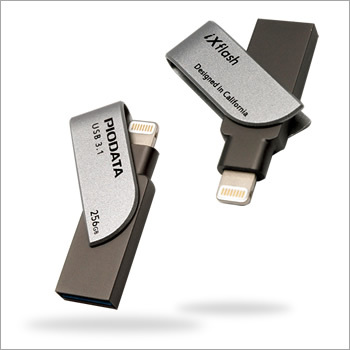 Free up space on your iPhone or iPad quickly with the iXflash drive. 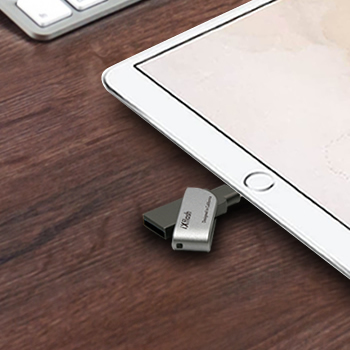 Simply plug in the Lightning connector and you can easily move all or select photos, videos and other files off your device and onto the drive. From there, you can transfer the files onto a Mac computer or PC or store them on the drive. 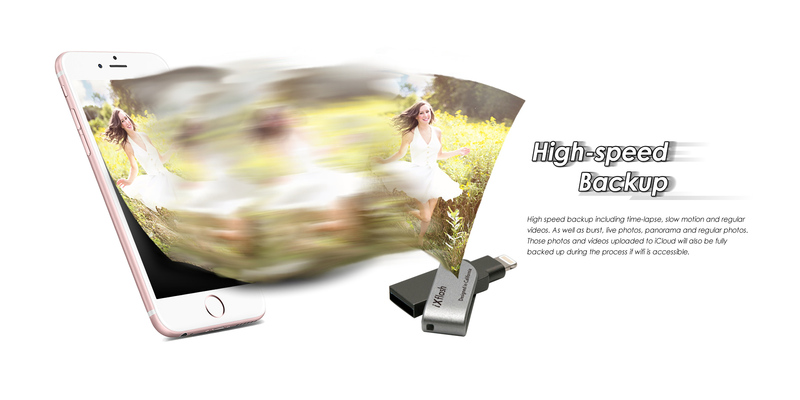 With just one touch, it allows you to continue viewing or listening the last media file opened. Gives you the ability to quickly and easily view files you selected as favorites without having to search through tons of other content stored on the device. 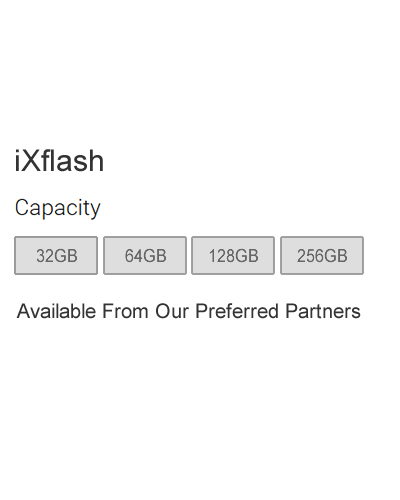 View all content stored on the APP on your iPhone or iPad even when the iXflash is not connected to your device. Adjust the settings for your iXflash if needed. 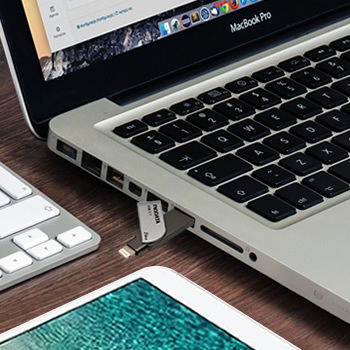 The iXflash Drive is designed with an extended Lightning connector that can plug directly into your iPhone or iPad without having to remove your case. Plug the drive into your computer’s USB 3.0 port and you can transfer files in a flash. 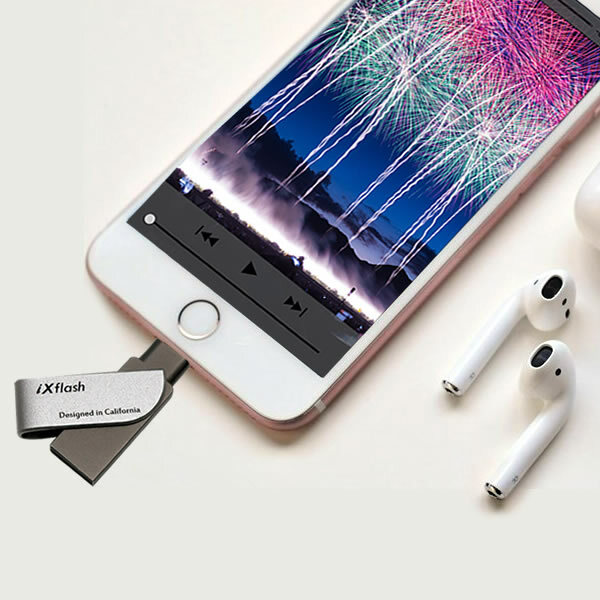 Available from the App Store, the iXflash Drive app makes it easy to manage your photos and videos and access of the devices many features directly from the drive. 1. 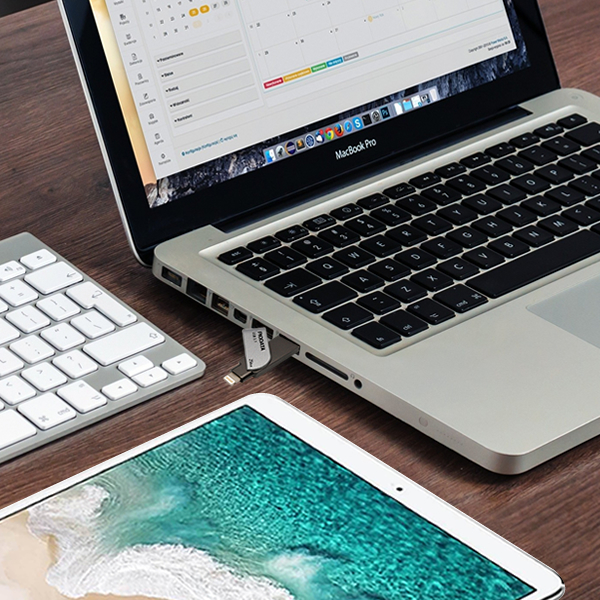 Supports iPhone 5 and newer, iPad Air, iPad with Retina display (4th generation), iPad mini with Retina display, iPad mini and newer, iXflash Drive app and iOS 8.2 required. | 2. Available for download from the App Store. iOS 8.2 required. Setup automatic backup within app settings. | 3. Support for .MP4, .MOV video formats. DRM-protected content cannot be streamed. Check with the content provider for playback restrictions. | 4. Supports iPhone 5 and newer, iPad Air, iPad with Retina display (4th generation), iPad mini with Retina display, iPad mini and newer, iXflash Drive app and iOS 8.2 required. Support for .MP4, .MOV video formats. DRM-protected content cannot be streamed. Check with the content provider for playback restrictions. | 5. Password protection uses 128-bit AES encryption and is supported by iOS 8.2, Mac OS X v10.6+, Windows Vista®, Windows® 7, Windows 8 and Windows 10. FOR CHINA: Password protection is supported by iOS 8, Mac OS X v10.6+, Windows® XP, Windows Vista®, Windows® 7, Windows 8 and Windows 10. 6. 1GB=1,000,000,000 bytes. Actual user storage less. Copyright © 2000 -2018 PioData Inc. All Rights Reserved │ PIODATA USBフラッシュドライブ PioData is a Subsidiary of Vinpower Digital Inc.